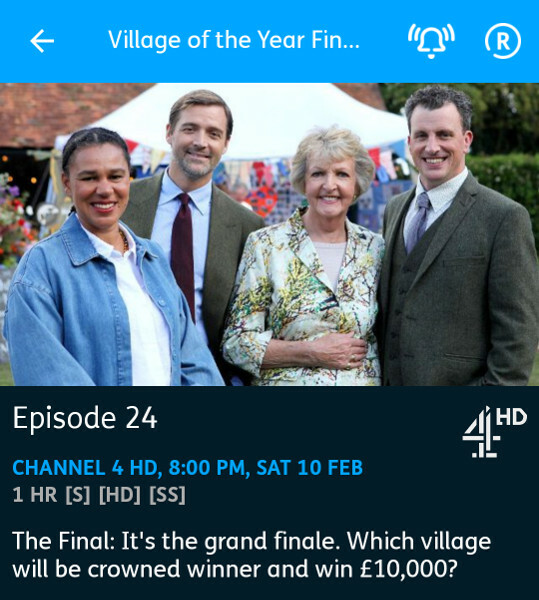 It’s the grand final of Village of the Year. Across 19 heats and four semi-finals, 76 villages have been whittled down – and now only four remain. There’s one last chance to impress, as each of the villages put on a special event for the judges to showcase everything they think makes their village great. Then, residents from each of the final villages gather together at a Village of the Year fete. The judges consider everything they’ve seen before Penelope Keith announces which village will be crowned Village of the Year and win £10,000. Drama about a group of midwives in 1960s London. Sister Julienne is drawn into the heart of a different culture when she is called upon to help a Pakistani family. Having come to terms with her own childlessness, Mumtaz Gani is heartbroken when her husband Saddiq brings home a second wife who is eight months pregnant. Sister Julienne must help Mumtaz come to terms with this new addition to her family. Elsewhere, Trixie struggles to cope after her break-up with Christopher and looks for comfort at the bottom of a bottle. But it is not long before she can no longer conceal her struggle with sobriety. Sister Julienne and Dr Turner are convinced Sister Monica Joan needs cataract surgery, but before having the first consultation she must acknowledge that her vision is impaired. At clinic, Lucille meets a woman with pica – but this is no ordinary craving, as Mrs Campbell cannot stop eating coal. Mark Bonnar narrates a series revealing the hidden world of Galloway Forest, the country’s largest afforested area. John ‘Cool’ Coughtrie and his Recreation Team boss Archie McNeillie spend the days leading up to the Galloway Hills Rally preparing safe places for attending crowds along the route to stand. Reigning champion and local legend Jock Armstrong hopes to defend his title and is thinking of nothing but the finish line. On the day of the rally, a troop of the event’s safety marshalls are on duty helping Archie to keep a watchful eye over proceedings. At Penninghame, tree planter Alastair Livingstone restocks a recently felled site with sycamore and oak. The Forestry Commission plant 4.5 million trees a year and Alastair has single-handedly planted over a million. Wildlife ranger Grant Carson works to manage the thousands of deer that roam the Forest Park to prevent them from damaging valuable recently planted trees. Revival of the classic sci-fi drama. After a violent home invasion, Mulder and Scully go on the run from Russian gunmen while following a trail of clues left by their long-dead friend Langly. Train crews in the Rockies must haul their 15,000 ton grain train through ice-encrusted tunnels to make their delivery on time. Crime drama set on the remote Scottish islands. Thomas Malone returns to Shetland after serving 23 years in jail for the murder of teenager Lizzie Kilmuir, a crime he swears he didn’t commit. Whilst most of the islanders are convinced of Malone’s guilt, the appeal and his subsequent release have thrown up the possibility that someone else could be responsible for Lizzie’s murder, but as Malone arrives back on Shetland, local journalist Sally McColl is found murdered. Perez and the team must investigate both cases. With unprecedented access to IKEA’s design studios, factories, test labs and stores over the course of a year, this series gets to know the people who work for the famous company. In episode two, we see what it takes to get new products from initial design to stores around the world. One of IKEA’s newest designers, Hanna-Kaarina Heikkila, wants to challenge mass production by creating an ‘imperfect vase’ that has the finger-marks of the creator – she travels to China to see if her idea is possible. Detective drama series set on a Caribbean island. Long-buried memories are raked up for JP when someone from his past is caught red-handed at a murder scene and Jack must unravel a complex mystery to find the truth. TV presenter Anna Richardson takes her Staffie to the Peak District, including a walk through Dovedale and a spot of trout fishing. Jimmy Doherty is by the Suffolk seaside with his Irish terrier, visiting Aldeburgh and Thorpeness. And comedian Bill Bailey takes a pleasant stroll through Richmond Park with his dingoes Boolay and Banjar and tries a session of yoga for dogs.